When Jacques Cartier first landed in the New World he hoped to find precious gold. Instead, the riches which Europeans found here were fish and furs. Early contact with the Indigenous peoples established trading patterns. The First Nations brought fur pelts of otter, mink, marten and fox and traded them for European tools, pots and liquor. The fur was used to decorate the coats and hats of the well-to-do in Europe. Later, around 1600, Europeans discovered that the short soft fur close to the beaver skin was ideal for processing into feltfelt: a kind of cloth that is not woven but made by rolling and pressing together wool, hair or fur. for beaver hats. The increasing demand for beaver pelts sent coureurs de boiscoureurs de bois: the coureurs de bois were skilled woodsmen, trappers & canoeists, important to the fur trade. into the woods of Canada to trade with Indigenous peoples. Different companies financed fur trading expeditions. In 1608 Champlain gathered these companies under one organization, the Company of One Hundred Associates, which established a permanent trading post on the site of Quebec City. 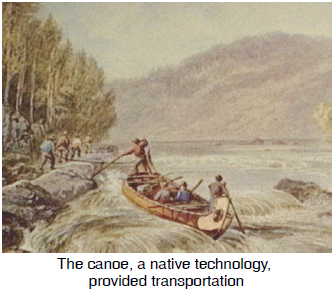 The early French fur traders explored and mapped the Great Lakes area and the Mississippi River system. Most of the English fur trade was run by the Hudson's Bay Company, established in 1670. By the 18th century, a rival large trading company, the North West Company (or Nor'Westers) out of Montreal, was competing with the HBC and their rivalry opened up much of the west to European development.